Dr. Reddy is a board-certified medical oncologist and hematologist with expertise in treating solid tumors and blood cancers. 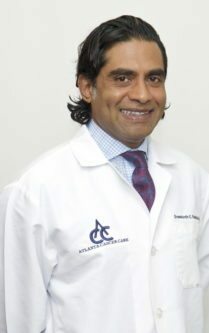 He completed training in internal medicine at St. Lukes-Roosevelt Hospital of Columbia University and was a fellow in oncology and hematology at Emory University School of Medicine. Dr. Reddy is a managing partner of Atlanta Cancer Care and he is the principle investigator in multiple cancer clinical trials. He is a member of the Northside Hospital Lung Cancer Work Group, Lung Cancer Research Group, Genitourinary Work Group and Gastrointestinal Malignancy Work Group. Dr. Reddy has published articles on multiple myeloma, head and neck cancer, and lung cancer.